Stunning Plants already growing away nicely in pots, supplied covered in flower buds and blooms. Fantastically fragrant and a magnet for butterflies and bees. French Lavender - Lavendula stoechas Mini Trees For living aromatherapy in your garden, you could not do much better than getting some of this gorgeous French Butterfly Lavenders in to your garden. A favourite plant of gardeners of all ages for generations, these plants have a magnificent fragrance all of their own as you brush past them, and stunning large flowers, magenta-purple in colour, topped by paler mauve-pink petals that are reminiscent of butterfly wings, fluttering gracefully on a breezy day on stems carried above the aromatic silvery-grey-green foliage. With the name butterfly lavender, as you might imagine, they are also very attractive to beneficial pollinating bees and nectar-loving butterflies in the garden. Butterflies love to visit this lavender, so if you want to attract butterflies to your garden, this lavender variety is highly recommended. The fragrance of this lavender is very different from the familiar English lavender, it's not easy to describe, perhaps the best description would be a lovely lemon-pine scent! With this plant, you could start producing your very own pot-pourri at home! Perfect for patio planters, these will thrive in full sun and well drained soil. Lavenders will even forgive you if you forget to water occasionally. 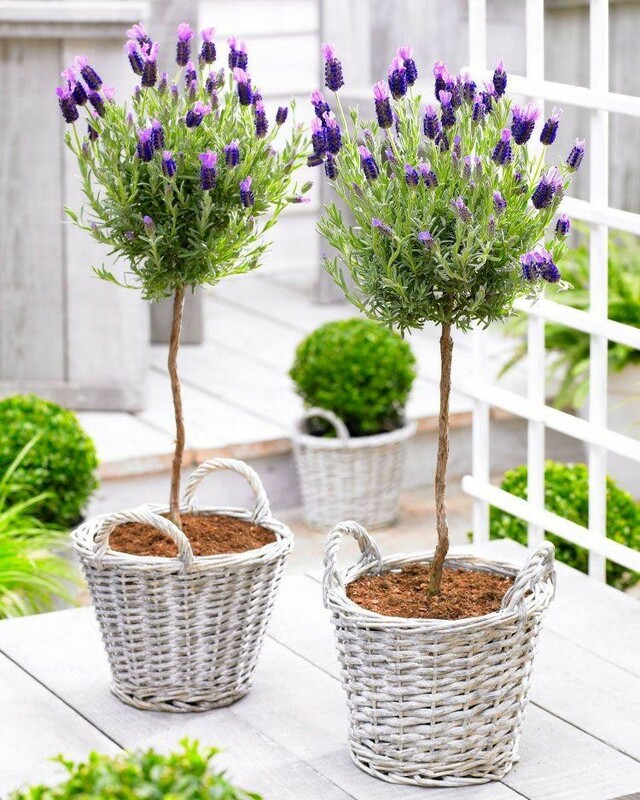 Pair of French Lavender Mini Trees with a clear stem and lollipop head of foliage starting to bloom in approx 2 litre containers. Simply remove spent flowers and feed throughout the season for a continuity of flowers all summer long. Supplied as pictured, with an overall height of around 60cms. Please note, baskets pictured are not included. To buy with baskets, click here.